The convening kicked off with an evening of connecting and building community among the fellows at Pangea World Theater. Pangea, dedicated to presenting international and interdisciplinary theater, is a longtime key partner to First Peoples Fund. Their welcoming and dedicated directors, Meena Natarajan and Dipankar Mukherjee, led the group through movement and theater exercises and served a delicious dinner. Sharon Day (Ojibwe) from Indigenous Peoples Task Force and a member of Pangea’s board, opened the evening with prayer. It was the perfect beginning to an instructive and invigorating gathering. The evening also served to recognize how Pangea — and performing and presenting arts — intersect with First Peoples Funds’ work across the country. Spoken word, hip-hop, folk songs. 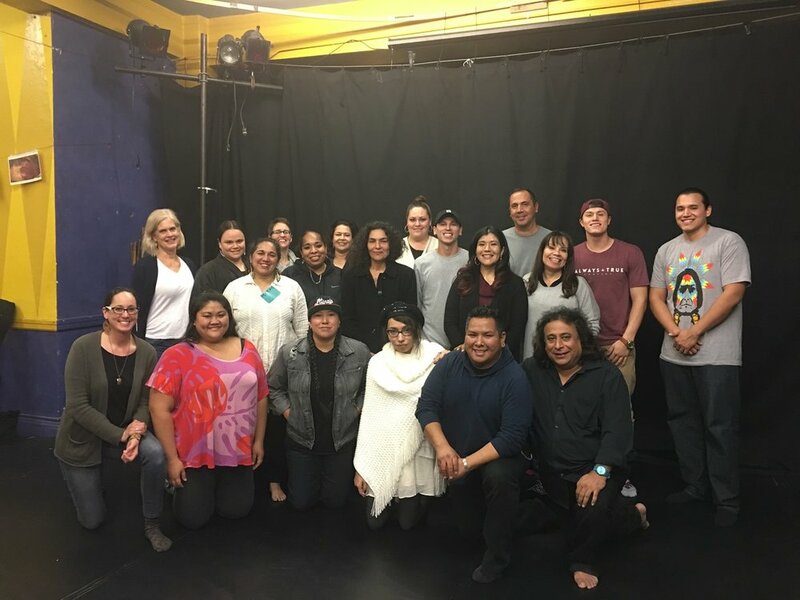 Melodic and visual, performing arts have become an even more integral part of First Peoples Fund’s work to support Native artists over the last several years with support from the Mellon Foundation. These art forms were well represented among the 2017 fellows at the convening: hip-hop recording artists Mic Jordan (Ojibwe), Tall Paul (Paul Wenell Jr., Leech Lake Band of Ojibwe), and Gunner Krogman (Rosebud Sioux Tribe); folk music singer/songwriter Annie Humphrey (Anishinaabe/Leech Lake Band of Ojibwe), and spoken word poet Tanaya Winder (Duckwater Shoshone, Pyramid Lake Paiute, and Southern Ute). Inspired by breakout Native hip hop artist and former FPF Artists in Business Leadership fellow Frank Waln (Sicangu Lakota), Tanaya Winder is now a fellow herself. She travels widely, helping build the growing Native hip hop and spoken word movement, and has even attended FPF board meetings. A strong advocate for youth, she is the director of the Upward Bound Program at the University of Colorado Boulder. She created Dream Warriors Management, an Indigenous artist management company and collective that includes FPF fellows past and present Frank Waln, Mic Jordan and Tall Paul. The convening continued the next day at Open Book for a full day that began with a welcome and prayer. Then came the “Artful Introductions,” a chance for artists to share their stories with paper, pencils, clay and more. They created visual representation pieces of art to introduce themselves to the cohort, a powerful way to show how the artists became artists — and how family tradition or a means of healing guided the direction of their lives. “The artists are all so talented, humble and supportive of one another. I was deeply moved by each person’s story,” said Marsha Whiting (Chippewa Cree Tribe and Sicangu Lakota), FPF vice president of operations and programs. The 2017 artist cohort covers a broad range of mediums: filmmaking, mixed media sculpting, singing, songwriting, graphic design, printmaking, drawing and painting, poetry and spoken word, textiles and sewing, wood carving, quill and beadwork, photography, and storytelling. They came from all over the United States, from Alaska to Oklahoma to right next door in Minneapolis. At the convening, our staff was dedicated to fulfilling the mission of First Peoples Fund, while the speakers and instructors shared years of wisdom and experience. Lori Pourier (president, First Peoples Fund) spoke about Indigenous Arts Ecologies. Rooted in the traditional values of generosity and respect, humility and fortitude, First Peoples Fund uplifts the Indigenous Arts Ecology — relationship-based ecosystems that strengthen Native arts and culture grounded in ancestral knowledge. Marsha Whiting built enthusiasm about the future direction and growth of First Peoples Fund and Program Manager Jeremy Staab (Santee Sioux) led a roundtable discussion for the artists. FPF trainer and PA’I Foundation Folk Arts Coordinator Kaʻiulani Takamori (Native Hawaiian) presented how FPF’s field work unfolds in Hawaii. The rotation sessions were customized for the fellows. With peer learning and hands-on work, the fellows engaged with professionals in the field on topics from how to use a smartphone for professional images to getting their digital marketing questions answered to the finer points of copyright and trademark. Working in small groups allowed them to share collective knowledge for personalized learning. Performing arts is being weaved into the training curriculum to serve the unique needs of these artists. Steve Wewerka, whose work has appeared on the cover of Life Magazine, and in Newsweek, Time, Sports Illustrated and the York Times, led the photography session. FPF Program Manager Jessica Miller led the session on Digital Marketing. Artists rapidly gained skills they can use to create and promote their work. Steve Wewerka instructing fellows on photography lighting techniques. On Saturday the convening resumed at Open Book. Led by attorney Leonard DuBoff, “Law in Plain English for Artists” offered a chance to ask burning questions about everything from copyright infringement to intellectual property of the leader in the field of arts-related legal issues. As always, mealtimes and the closing talking circle hosted on Sunday at All My Relations Gallery offered a good opportunity for connecting and forming lasting bonds. In the talking circle, fellows shared about how art empowers community, how Native artists use art for self-representation, and offered prayers and songs to close out the weekend together. All of our artists are moving their work forward, developing as individuals who impact their communities to reach out nationally. They are living the Collective Spirit®. Collective Spirit® is that which moves each of us to stand up and make a difference, to pass on ancestral knowledge and simply extend a hand of generosity.